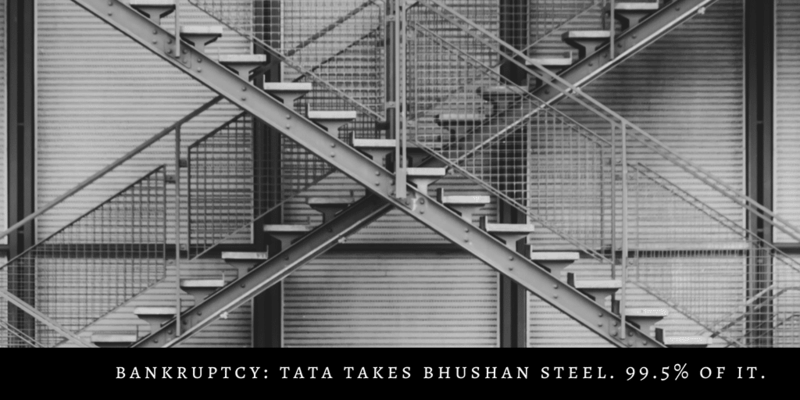 The Bhushan Steel Bankruptcy Saga: Tata Steel Takes Over With 99% Ownership, Eventually. It’s nearly final. Tata Steel has taken over Bhushan Steel. In what is the first big resolution in the NCLT bankruptcy cases (Read our coverage) the company that owed over 50,000 cr. to banks has been purchased lock, stock and barrel for Rs. 35,000 cr. (and some change). Tata Steel’s subsidiary, Bamnipal Steel, will take over Bhushan Steel. How does this work? The basic point: Financial creditors will get Rs. 35,200 cr. for all the debt in the business. All of this money will be given by Tata Steel to Bhushan, as a loan (the most part) and some equity. But there’s an order that things will go through. Lenders have to invoke all their shares. They have all the promoter shares pledged (well, most of them) and these promoters will have to give them up to the banks. The promoters have around 8.5 cr. shares (out of about 22.5 cr. in total), so the banks will get most of that. Total Share Capital: 29.90 cr. shares. of which existing shareholders own 22.65 cr. or about 76%. Bamnipal Steel (Tata Steel’s subsidiary) will now pay Rs. 160 cr. and get around 80 cr. shares, at Rs. 2 each. Note this carefully: They’re buying at a price of Rs. 2. Right now it sounds decent. But it gets way way worse. Banks will see a return of around Rs. 35,200 cr. to them. Where is that money going to come from? Bhushan Steel has no money. Tata Steel will “lend” money to Bhushan. They’ve bought shaers worth 160 cr. (Step 3 above). The remaining money – around Rs. 35,000 cr. – will be a loan from Tata Steel to Bhushan Steel. Banks get back this money which is probably around 60% of what they are owed. (They are owed more than Rs. 55,000 cr.) There’s a good and bad impact on banks but we’ll come to that. Not all of this money is pure debt. Tata Steel can convert Rs. 9000 cr. of the loans to equity. At what rate? Well, our view is: at Rs. 2 per share! (That’s our estimate. We will know soon when the official notification comes) Why would they pay more? If you have the ability to do a convertible, you’ll do it at Rs. 2 per share (face value) because you have complete price control. Bhushan Steel has a 5.6 mtpa plant. After conversion to equity, it will have a loan of Rs. 26000 cr. (to Tata Steel). Assuming that’s at 10%, they would pay Rs. 2,600 cr. in interest costs. Their current interest costs are over 5,200 cr. so they will reduce interest costs by half. This is likely to require an EBIDTA of Rs. 4,500 cr. per year – which is possible. At a EBIDTA multiple of 10, the enterprise value (debt+equity) is at Rs. 45000 cr. Debt is Rs. 26,000 cr. so equity will be valued at 19,000 cr. But there 4,600 cr. shares, so the valuation of the company will be Rs. 4 per share or so. Even if the company recovers, the price per share – because of the heavy dilution – will be Rs. 4. SEBI’s current rules are that an acquirer cannot buy more than 75% shares in a company. Does this mean that Tata Steel can never convert its loan to shares? (a) Existing provision – In terms of the proviso to regulation 3(2) of the SEBI (Substantial Acquisition of Shares and Takeovers) Regulations, 2011 (“Takeover Regulations”), an acquirer shall not be entitled to acquire or enter into any agreement to acquire shares or voting rights exceeding such number of shares as would take the aggregate shareholding pursuant to the acquisition above the maximum permissible non-public shareholding. (b) Proposal -In case the said provision is not relaxed, it may hamper infusion of capital for ensuring revival of a listed corporate debtor. Accordingly, the said proviso to regulation 3(2) of the Takeover Regulations may be amended to permit acquisition of shares,in accordance with a resolution plan approved by NCLT, in excess of the maximum non-public shareholding, i.e. 75% presently. If this happens, then there’s no protection from the law – and we believe this has to happen otherwise no one will bid on these bankrupt companies. Tata’s Will Be Kind To Current Shareholders? Some people say “the Tata’s won’t do this” etc. This is business, and anyone should do this. A company is bankrupt. It’s current shareholders should be reduced to zero. The Tata’s are paying a truckload of money. They deserve to own the entire company. And with 99.3% they will be nearly doing so. With 72% there’s no point at all. We don’t think there’s any reason to believe that for no reason at all, Tata Steel will hand over 28% of the company to existing shareholders and banks. In fact, it’s quite likely that Tata Steel will convert and delist the company, and even the delisting rules will be relaxed (such as an open offer requirement and so on). But the Share Price is Rising! The stock has been hitting upper circuits every day since the resolution. It’s at Rs. 31 now. This is very good for existing shareholders – and indeed, all the banks that are getting 7.5 cr. shares. They have the ability to sell and get something out of it. There is a lot of irrationality in the market. Markets may remain like for long, ignoring the massive impending dilution, until some thing happens where the Tatas actually exercise their rights. That will be too late – like upper circuits are rife today, it might just be a time for lower circuits. As bankruptcies go, the price here of anything more than Rs. 4 is a huge bonus, according to us, and therefore it’s a worthwhile point for current shareholders to think about the dilution and wonder if their stake is worth it. For Tata Steel this is an expensive stock to own, but it’s the fastest way to expand capacity at a time when interest rates, for them, are relatively low. But they’re not known to make acquisitions work well; and paying a high price now is a little dangerous. Disclosure: Not even touching Bhushan with a Barge Pole. No positions in Tata Steel either. No relationships with either companies, though some of us oldies still remember the ad that went, “We also make steel”. Note: Read our other posts on how Bankrupt companies are being resolved, and why we see little room for current shareholders to rejoice.